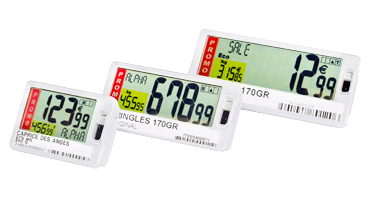 Segment-based LCD labels provide a cost-efficient solution when a large number of labels are required and bring clear, precise information to the shelf edge with flashing and scrolling functions, and in a wide range of layouts. NFC technology can be included for more customer interaction (provide gluten-free information, link to promotions etc). The SmartTAG Medium label also exists in a FREEZER version which is optimized for freezer-usage. Operates down to -30°C.